Jump Festa is primarily an event for the fans of the various comic series that appear in Weekly Shonen Jump magazine. I knew this. Still, the wait outside the Makuhari Messe convention center made me feel uneasy: there were just way too many people there. The line started in earnest a good five hundred meters away from the entrance, and then snaked 500 meters away from the entrance, paperclipped around, snaked back, and paperclipped again. We went on paperclipping and snaking for about an hour before we were finally let into the building. 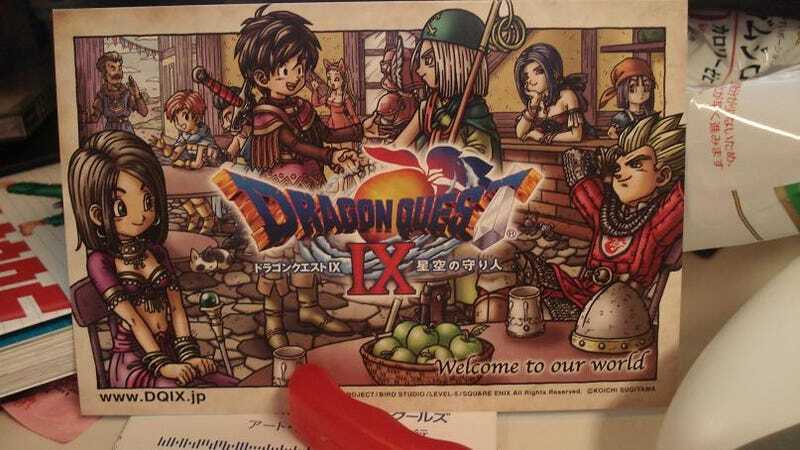 I realize this article is meant to be a report on what it was like to finally play Dragon Quest IX, after years of dreaming, since I fell in love with Dragon Quest as a child, what it would be like when there were eight more games in the series, and what kind of game the ninth one, in particular, would be. However, I am giving all of this prelude here to inform you as coldly as possible that, contrary to my wide-eyed amazement, Dragon Quest IX was not the most-crazed cultural event happening on that day. No, the vast majority of the masses were content to stand dead still, and scared, in many of the humid, vacant convention halls, listening in on multiple clashing stage shows in which attractive young male voice actors inexplicably wearing drivings gloves pointed at the masses and recited catchphrases, where sleepwalking electric female mannequins urged the crowd, in impossible voices, to outwardly display their recognition of how fantastic this moment right here is. When in line to enter the convention, I had presumed that Dragon Quest IX was the main event. The front of the event's homepage had prominently featured a Dragon Quest IX logo. The first ten pages of Jump, every week, are more often than not occupied by full-color advertisements for Square-Enix games. Despite Square-Enix having their own comic magazine (one called "Young Gan-Gan"), Jump' readers love them; the Square-Enix aesthetic is inseparable from the Shonen Jump reader's psyche: this is a stone-cold, ice-hard fact. It was clear, when the return of the menus was announced, that players currently engaged in battle would be represented on the field map as clashing with a monster, and that other players could enter the battle if they approached. Though I wondered how fair that was. Couldn't the player in a battle just be like, "Hey dudes I'm about to die over here" and then just . . . not input commands for a couple of minutes while his friends worked their way over there? At least the game looks good — the battles are presented like in Dragon Quest VIII, and the field is a Zelda / Dragon Quest VIII kind of thing, with rocks and hills and rivers and what-have-you — and sounds good —Koichi Sugiyama is indeed still alive — and plays . . . familiarly. The one town — with a castle — that we made it to at the end of our short romp through the field was pretty, and inviting, in that Dragon Quest kind of way. Forming a party with friends was as easy as walking into the inn and talking to the innkeeper. The weapon shops sell weapons, the armor shops sell armor, and the townspeople still say the same cute little world-creating single sentences.